In close proximity to the Olympic Park, the Montreal Botanical Garden is one of the largest of its kind. Home to more than 22,000 plant species and roughly 30 exquisitely mapped out gardens, it's well worth a visit any time of year. 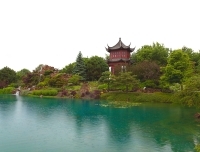 Begun in 1931, in the midst of a financial crisis in the city, the garden provided work for thousands of unemployed Montrealers and has since developed into a popular tourist attraction, with an astounding array of plants and trees. An array of interesting sights and sounds await the visitor, including the Tree House (highlighting the important role of trees in our lives), a First Nations Garden (illustrating the interaction of Inuit and Amerindians with nature), a Chinese Garden, the Quebec Butterfly House, a Medicinal Plant Garden, Planetarium, and so much more.